On behalf of the All India Chess Federation, Bengal Chess Association will be organizing a Senior Arbiter Examination at ICCR Kolkata, at 09.00 AM on Saturday, 19th May 2018. However, the Bengal Chess Association will conduct a doubt clearing session for the benefit of aspiring arbiters from 09.00 AM to 01.00 PM on 18th May 2018. Interested persons, who have completed 16 years of age, may kindly send the attached registration form filled and duly forwarded by their respective state association along with a fee of Rs.4000/- by Demand Draft favouring All India Chess Federation payable at Chennai. 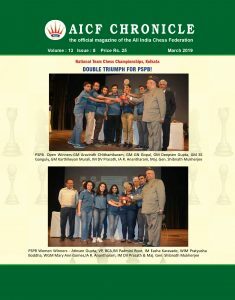 The same may be sent to All India Chess Federation, Hall No. 70, Jawaharlal Nehru Stadium, Periamet, Chennai – 600 003, on or before 10th May 2018. Please be informed that you will attend the examination at your own cost including boarding & lodging. Only first 30 persons will be accommodated. Course material for the examination will be available for download from the website and participants are requested to come prepared for the examination. a) White’s action is correct. b) White’s action is wrong. He must make all the moves with right hand and press the clock with right hand only. c) White’s action is wrong. He must make all the moves with right hand but may press the clock with any hand.